Your Wi-Fi name (SSID) is basically the router's wireless name and is one way of securing the network. The SSID is shared by all devices in your Wi-Fi and therefore, has to be unique since this will identify your network from the rest. If you are using the WRT54G3G or a router that has a different UI, click here. 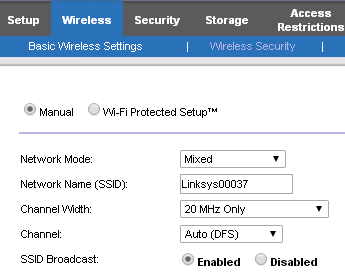 When the router’s web-based setup page opens, click Wireless. At the Wireless > Basic Wireless Settings page, select Manual. Look for Network Name (SSID) and change it to your desired name for the Wi-Fi.